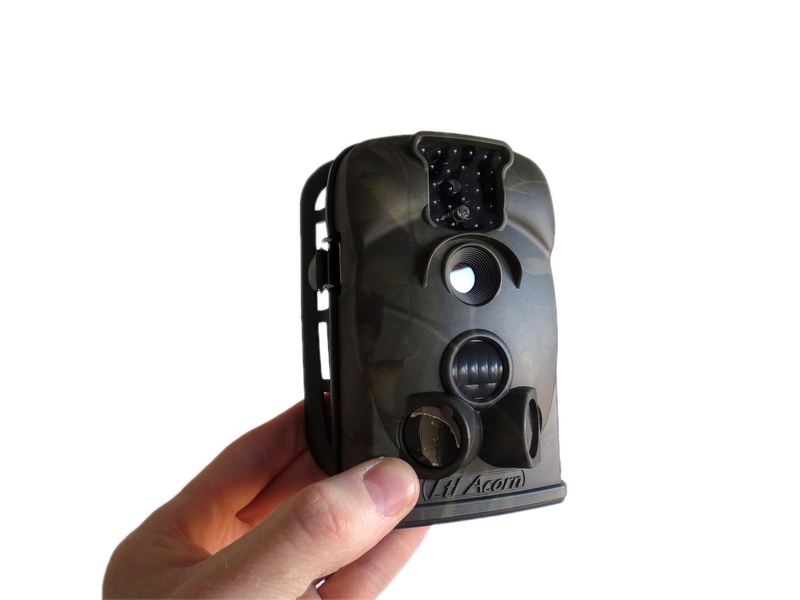 The Ltl Acorn 5210A is a wildlife trail camera, it offers long running time, 1080P HD video resolution with audio recording & 12MP photos (interpolated from 5MP). Perfect for capturing video or photos of wildlife in your garden, woodland or anywhere you need to deploy a motion activated camera. Equally usual for security surveillance applications! 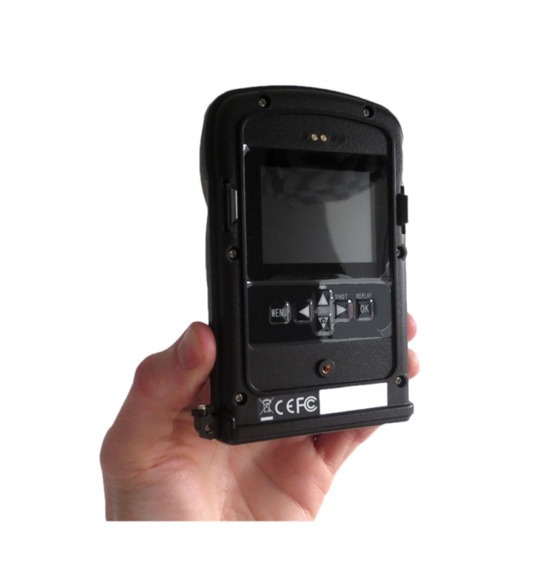 Often known as a game camera, scouting camera, hunting camera or wildlife camera trap – this device is also used extensively for security video surveillance in remote areas where connection to mains power is not possible. Thanks to the built in infrared (night vision), it can capture video footage & photos in complete darkness or daylight and will only do so when motion is detected as it also has built in motion sensors. The Ltl Acorn 5210A can take photos of 12MP quality (interpolated from 5MP) or record video clips (with sound) at 1080P resolution. You can even set the camera to take a photo then a video clip if you want to, all triggered by movement/heat change within the camera view. The 5210A has password protection, 16G max SD card storage (SD card not supplied as standard), time & date stamping, timer recording (explained in the next paragraph), password protection and even a time lapse feature that allows you to tell the camera to take a photo/video clip at set intervals regardless of whether any movement has been detected. The built in Timers on the 5210A trail camera are ideal if you want it to only record between certain hours of the day or night. For instance, you may want it to record in your back garden only at night time, so you can set it to trigger only between 8pm in the evening and 6am the next morning. The Ltl Acorn cameras are very easy to use, all set up is done via the built in LCD screen and the menu system – no software is required to use the non cellular Ltl Acorn cameras. The camera holds a maximum of 8 AA batteries, but can run off just 4. As you would imagine, the more batteries you fit the longer the running time. Batteries are not included but battery choice is vital for the efficiency of your camera, do not use Duracell and do not choose any batteries with a capacity lower than 2500mA. We recommend Vapex Instant 2500mA Low Self Discharge Rechargeable AAs which you can purchase directly from us, they work very well with the Ltl Acorn cameras and are excellent value for money. The Ltl Acorn 5210A can be purchased with either the standard (850nm) or the covert (940nm) infrared. The 850nm is about 30% more powerful but the leds give off a feint red glow when in operation, the 940nm leds are not as strong but not not glow at all and so are more suitable for covert surveillance applications. Since February 2018, all Ltl Acorn cameras have the infrared brightness adjustment feature. The user can then choose between 3 different night vision strengths to suit their surveillance location. This feature helps to avoid white out issues when filming animals or human subjects that are close to the camera. The Ltl Acorn wildlife cameras require an SD card to operate, without one inserted the camera will switch itself off immediately after power up. The 5210A can hold a 16G SD card maximum. Always use SDHC and class 10 cards. For our full easy set up guide plus guidelines and maintenance information for your Ltl Acorn 5210A trail camera please click here. Another new feature added to the Ltl Acorn cameras in early 2018 is the much reduced standby power consumption, this means that your batteries should last a lot longer than previously and puts the Ltl Acorn cameras another step ahead of much of the wildlife camera competition out there! I’m really enjoying the camera & already have some great videos of badgers, fox, deer & a variety of birds, feeding in the clearing of my wood. A very easy and efficient transaction. The camera works well in all weathers and has produced some great pics/videos of local wildlife including badgers. Camera setup is straightforward. I fully recommend this camera and the vendor. I haven’t been able to use it. Despite being very careful in removing the camera from and reattaching to the battery box several times, aligning them before closing the securing clips, one of them broke off. PAKATAK Reply: Very sorry to hear that, we have sent you a replacement back compartment for your camera. Great field camera for its price, especially like the timer facility which some more inexpensive cameras don’t have. Please read all information below (especially the section about batteries & switch cleaning) before reporting any faults or missing items! Thank you. The information contained in this post is applicable to the Ltl Acorn 5210A wildlife camera model (both 850nm and 940nm infrared array styles). Open the hatch at the base of the camera & insert an SD Card (16G max) and AA batteries (at least 4). Please read the section further down on this page for information on which batteries to use – your battery choice is vital to the performance of your camera. Move the switch on the bottom of your camera to the TEST position. Push the MENU button & use the arrow keys to select & change settings. Remember to push the OK button after each setting change to save it. Flick switch to ON position, LCD screen will now switch off & your camera is ready to be deployed. When you first put the switch into the ON position you may notice a red light flashing on the front of the camera, this light just denotes that the camera is readying itself and it will stop flashing after about 10-20 seconds. Close the bottom hatch & re-fit the back plate before putting the camera in your chosen location. Remember to close the side clips and tighten the screw on the back of the camera by hand – this screw helps take some of the pressure off of the side clips. You can push the “menu” button when looking at any particular recording in playback mode and you’ll have the option to delete that file or delete all files on the card. You can also use the “format” option in the main menu to delete and clear everything from your SD card if you wish to. Please note, your 1 year warranty is always with your retailer. However, here at Pakatak Ltd, we carry & sell Ltl Acorn spare parts and are always happy to test your camera for you if you think it has developed a fault. Batteries are not included but battery choice is vital for the performance of your Ltl Acorn 5210A camera, do not choose any batteries with a capacity lower than 2500mA. Always use genuine branded SD cards, there have been in the past many fake cards on the market (especially being sold on Ebay etc). Also, always format your SD card using the “format” option in the camera menu, do not format your SD card in your PC for use with the Acorn cameras. Always use SDHC, Class 10 cards. Also reset your camera to default settings via the Menu when in TEST mode. This is something that is worth doing periodically to ensure the best performance and longevity of your Ltl Acorn camera. If your Ltl Acorn 5210A camera has a serial number beginning with 5210, for instance 52106000634, then it will have the option of choosing from 9 different languages. The options are English, Danish, Dutch, Italian, German, French, Russian, Czech or Finnish. If your camera has this feature then you can adjust the power of the infrared, great if you are getting some white out issues on your night vision video footage or photos. When in TEST mode just push the downward arrow button on the camera, your current infrared brightness level will be displayed on the screen, push the downward arrow key again to change the setting, there are 3 levels available (high, medium & low) and your camera is likely to be set to high as default. On / Off / Test Switch not working correctly?